Two sibling violinists from Victoria are among the latest rising classical music stars who have won the loan of rare stringed instruments from the Canada Council of the Arts. 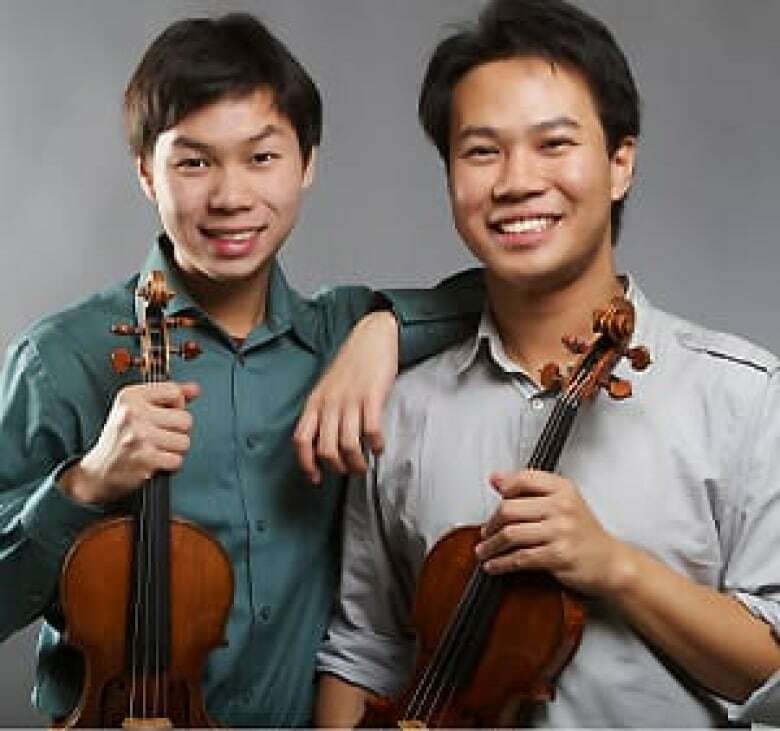 Two sibling violinists from Victoria are among the latest young Canadian classical music stars getting their hands on rare stringed instruments worth up to $11 million. Nikki and Timothy Chooi, along with 16 others, have won three-year loans of valuable cellos and violins from the Canada Council's Musical Instrument Bank, which revealed the latest recipients Wednesday morning. Elder sibling Nikki, 23, made the council's cut for a second straight term. In 2009, he chose the dark and powerful-sounding 1729 Guarneri del Gesu violin (valued at $5 million). This time around, he hoped to be able to pick something with a brighter sound to reflect the more "sparkling" repertoire he's currently learning. He ultimately chose the ca. 1700 Taft Stradivari (also valued at $5 million). "Playing the del Gesu for the last three years, it was an amazing journey... This time, I wanted to look for something that had kind of a brighter side," Chooi told CBC News on Wednesday morning. Currently pursuing a master's degree at The Juilliard School in New York, he's already discovered he must adjust his playing technique for the Strad, for instance using less pressure and increasing his bow speed — but he's looking forward to expanding and developing his skills. "How many people have the chance to change over from a del Gesu to a Strad? It's a once in a lifetime opportunity and so I thought I'd take advantage of that," Chooi said. Many musicians prize the violins and cellos made in Cremona, Italy, by famous luthiers such as Antonio Stradivari and Guarneri del Gesu, for their unique tonal expressiveness and projection. Despite centuries of technological advancement, modern violin-makers have been unable to duplicate their sound. Instruments built by Stradivari, for instance, are especially prized. He built more than 1,100 instruments in his lifetime, about 650 of which survive today. In addition to the famous violins, there remain violas, cellos, 10-string guitars, mandolins and an arpetta, a small ornamental harp. For Timothy Chooi, 18, having an older brother who knew the ropes of the competition's audition and selection process was a bonus. "It was a really great experience for me. It was really exciting," he said from Philadelphia, where he is studying at Curtis Institute of Music. "We always were together when we were trying out the violins. We played for each other. He told me what I sounded like and I told him what he sounded like." Timothy Chooi ultimately picked the del Gesu, saying he favoured the instrument after hearing his brother playing it. Also, once in his hands, it instantly felt comfortable, he added. "It has a very dark and deep sound. I've always enjoyed that darkness in a violin ... it has a lot of bass to it." 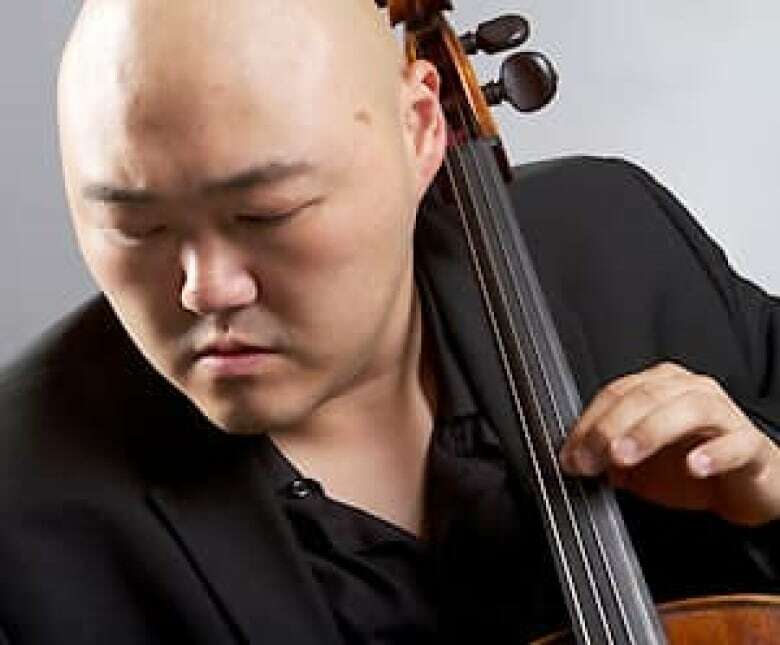 Calgary-born musician Arnold Choi, 27, placed first among cellists and opted for the council's priciest instrument: the ca. 1696 Bonjour Stradivari cello, valued at $11 million. 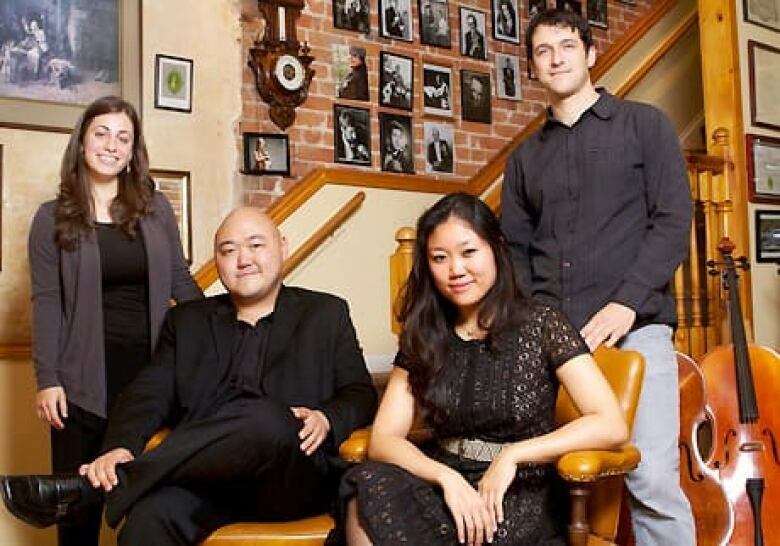 Choi recalled first hearing about the Instrument Bank competition as a teen and dreaming about one day playing a rare instrument in the collection. "Just holding it and knowing how much history the cello's had, how many people have played it, how many generations have passed it on — for it to be in my hands at that very moment, it was just so humbling," he said by phone from New Haven, Conn.
"Let's not forget how amazing a Strad sounds. It's just incredible. It's very easy to play. It has the most beautiful, rich, velvety sound of any cello I've ever tried. You can feel it vibrating on your whole body when you're playing it." Choi, who will graduate from Yale University in December, says one of his goals over the next three years is to play the Strad cello for a wide audience — whether by taking part in different types of performances or through recordings. "I really want the sound of this cello to reach as many ears as possible," he said. "The Strad has such a wide range of colours and wide range of projection ability, of volume... A mediocre instrument would limit my ability to express myself the way I want to. Having a Strad removes those barriers." Established in 1985, the council's Music Instrument Bank issues loans to "gifted young musicians to help further their international solo or chamber music careers." Philadelphia-based Timothy Chooi (of Victoria, B.C. ): 1729 Guarneri del Gesu, valued at $5 million. New York-based Nikki Chooi (of Victoria, B.C. ): ca. 1700 Taft Stradivari, valued at $5 million. Irvine, Calif.-based Iryna Krechkovsky (of Toronto): 1689 Baumgartner Stradivari, valued at $5 million. New York-based Emily Westell (of Calgary): 1717 Windsor-Weinstein Stradivari, valued at $5 million. London-based Jonathan Chan (of Burnaby, B.C. ): 1715 Dominicus Montagnana, valued at $900,000. Toronto-based Véronique Mathieu (of Quebec City): 1820 Joannes Franciscus Pressenda, valued at $380,000. New York-based Matilda Kaul (of Toronto): 1747 Palmason Januarius Gagliano, valued at $350,000. Montreal-based Emmanuel Vukovich (of Calgary): 1768 Miller Januarius Gagliano, valued at $350,000. Montreal's Boson Mo: 1871 Jean-Baptiste Vuillaume, valued at $250,000. Dallas-based Jing Wang (of Quebec City): ca. 1700 Bell Giovanni Tononi, valued at $250,000. Brandon, Man.-based Kerry DuWors (of Saskatoon): 1902 Enrico Rocca, valued at $225,000. Montreal-based Carissa Klopoushak (of Saskatoon): 1869 Jean-Baptiste Vuillaume and Vuillaume model bow, total value of $212,000. Toronto-based Andréa Tyniec (of Montreal): 1900 Stefano Scarampella, valued at $160,000. New Haven, Conn.-based Arnold Choi (of Calgary): ca. 1696 Bonjour Stradivari, valued at $11 million. Vancouver-based Ariel Barnes (of Toronto): 1730 Newland Joannes Franciscus Celoniatus, valued at $750,000. New York-based Se-Doo Park (of Toronto): 1824 McConnell Nicolaus Gagliano, valued at $500,000. Rachel Desoer (of Hamilton, Ont. ): 1929 Carlo Giuseppe Oddone, valued at $200,000. New York-based Karen Ouzounian (of Toronto): ca. 1830 Shaw Adam cello bow, valued at $50,000. 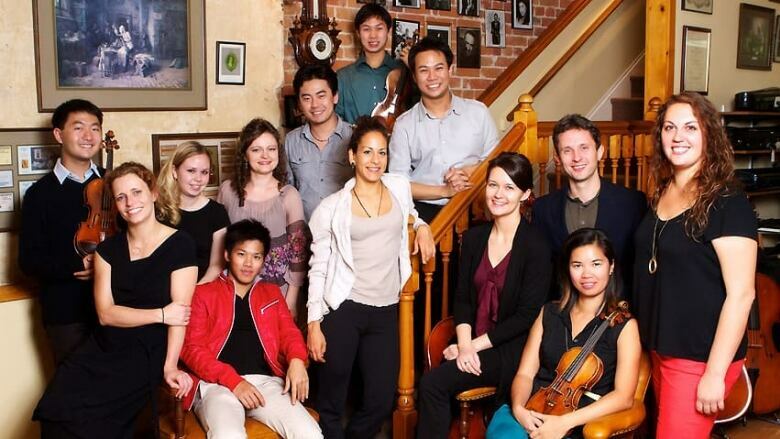 "Over the next three years, they will develop a very personal relationship with their instrument while sharing with the world their love of music, their passion for performance and their exceptional talents," Canada Council director Robert Sirman said in a statement. The program acquires new additions through donations as well as loans of fine stringed instruments, with the most recent acquisitions — three violins and two cellos — unveiled in June. All instruments are restored and maintained by Toronto luthier Ric Heinl. For the latest competition, the Canada Council considered 51 applications. A peer assessment committee selected 28 finalists to travel to Toronto for interviews and to compete in a live audition process. Each artist chosen was ultimately able to select an instrument from the council's five cellos and 13 violins — created between 1689 and 1929 — based on where he or she placed in the competition.